Deep Devil (W7W/KG-119) is a 2,500′ 2-point summit located in the heart of the Snoquamalie Forest on private logging lands. With a proper entry permit, the activation zone can be reached by traveling along about 5 miles of gravel logging roads (each way) and about 1,400′ of elevation gain. The summit offers broad views north, west and to the Cascade foothills and mountains to the east. Part of the summit is littered with logging slash that detracts from the surrounding beauty, but there are tall trees in some parts of the activation zones to escape the slash and to put up wire antennas. This is a perfect summit for an activation by bicycle. In a write-up for Lions Mane, I discussed the permit needed for non-motorized access to summits in the Snoqualmie Forest. Unlike Lions Mane, Deep Devil is entirely accessible by logging road. I chose to use a mountain bike for this activation. What that really means is that I spent part of the trip there pushing the bike on the steepest sections, and carefully coasting/braking on the return trip. Because this is a working forest, I strongly recommend doing this trip on weekends or holidays. Otherwise you will be dodging logging trucks for some of the route. This is a very busy working forest on weekdays. 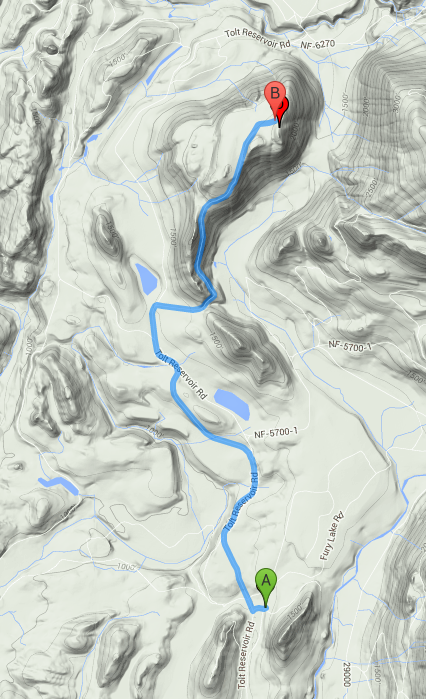 Getting to the Summit: The most direct public access is on the county road known as Fury Lake Road (Google Maps) or North Fork Snoqualmie County Rd (USGS Topo) or just N. Fork Rd SE (Bing). I described in detail (here) how to get to this road. The place to park is on the side of the road to the NW of Lions Mane. Lions Mane is hard to miss, but the GPS coordinates are 47.6221397, -121.7220569. There is a gate across a small road heading West. That’s the trail. Go around or over the yellow gate and head West for a short distance until the road intersects the Handcock Main Line road. Turn right to head north along this road. Soon you will come across a “Mile 10” sign. Follow the road until you reach “Mile 12.5”. A short distance later take a right on a road that heads uphill. Follow this road for about 2.4 miles to the summit. That’s it. Looking east from the activation zone. Notice the waterfall in the distance. The Adventure: I left my home in Redmond at 8:45 am on Superbowl Sunday (Feb 7, 2016), and was at the trail head in about 60 minutes. I had no previous reports for this un-activated summit, so I planned for three hours for the trip with some setup time. In fact, it only took about two hours to get there, with plenty of stops for photos, resting, and wildlife watching. It was amazing seeing, right up close, so many other SOTA summits in the Snoqualmie Forest. The roads were clear of obstructions until very near the summit when I came across a number of downed trees that were easy to ride or step over. Once I reached the activation zone, I spent the first 30 minutes exploring the summit, studying the landscape, and eating lunch. I had plenty of time to set up a mast with a 4 element 2m yagi and a 10 element 1296 MHz yagi for the VHF+ part of the activation, and a long wire antenna for the HF part of the activation. My radio pack was a little different for this activation. For HF through 2m and as a transverter IF, I had a KX3. For 1296 MHz, I used my all-mode transverter assembly. The assembly includes an SG-Lab transverter and an ancient DEM 12v 18W amplifier that puts out about 10W with the drive from the transverter. This assembly is primarily used for my UHF contesting rover, and this was my first use for a SOTA activation. The assembly uses SMA relays and a homebuilt (Picaxe-based) controller that includes a switch/relay to go between the internal 1296 MHz transverter and an external 900 MHz transverter. The transverter/amp assembly weighs about 4.3 lbs, which is not much more than my Icom IC-1201 (1296 MHz 10W FM mobile radio) at 3.6 lbs. The 903 MHz port on the transverter assembly can be hooked up to a 2m antenna, so I can use it as an antenna switch between 2m and 1296 MHz. This is important because, with the IC-1201 as my 1296 MHz rig, I can simultaneously coordinate on 2m while trying to work folks on 1296 MHz. With the transverter I wanted to avoid fiddling with coax on 2m. The “903 MHz” port allows me to switch between transverter IF and 2m, which is the next best thing. It is worth it to me to carry an additional 0.6 lbs to have CW and SSB capability on 1296 MHz! Weight wasn’t quite so important as this trip was undertaken by mountain bike. Station set-up while looking north. The activation began on 2m SSB, and I promptly worked a bunch of friends in the Puget Sound region including Stan (KG7P), Dale (KD7UO), Tom (KE7SW), and Ray (W7GLF). With only 3 watts from the KX3, my 2m signal wasn’t as strong as usual (previously I carried a FT-857d). The first three stations were south of me with plenty of rock between us. They copied me weakly. Ray was line of sight to the NW and we hammered each other’s S meter. Next I switched to 1296 MHz. Jim (K7ND) pounded in from Fox Island, followed by Ray, Fred (WA7TZY) and, a bit later, Susan (WB7BST). Unfortunately none of the stations to the South of me could hear my SSB or CW calls, and I couldn’t hear them. We even tried bounding off of Mt. Rainier and the Olympics to no avail. Ray and I completed a 900 MHz FM QSO before I swapped out the 1296 MHz antenna for a 6m dipole. My 6m CQs were answered by W7BA and then (in CW) by John, VE7DAY on Vancouver Island in CO70. Jim worked me again on 6m as well. I heard Lou (WA7GCS) calling me from Portland, but a dipole and 12 watts couldn’t quite cut it on this day. Next I turned to HF, where I was unable to scare up any QSOs except for N7ATB on 20m. Without cell phone data coverage to spot myself, and (apparently) with no gateway between RBN and SOTA Alerts, my 12W (or so) proved not very effective. I called CQ using the built-in memory keyer as I disassembled the VHF stuff. In the end, I believe my difficulties on HF were probably driven by a poor antenna set-up and orientation. The return trip was 40 minutes from summit to car. The biggest challenges were keeping speed under control and dodging larger rocks in the road.